According to ancient lore, and cult of the antediluvian pagan deity, Ginsu the Magnificently Pointy, a Spirit Knife consists of a bone blade bonded to the souls of the Mud People. He or she that defended oneself or took the life of an enemy with the Spirit Knife became magically bonded to the blade and, thus, the only person who could touch or wield it in future battle. 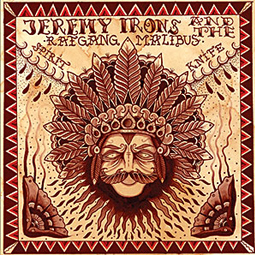 Spirit Knife is also the title of the new album by Jeremy Iron & the Ratgang Malibus — a.k.a. JIRM — and we have it on good authority that every musical warrior brave and proud enough to wield it upon release this April through Small Stone Recordings will find him or herself spiritually and eternally bound to its preternatural musical goodness — just like the Mud People of yore. Imagine, if you will, Jeff Buckley jamming with Can, and you’ll have a fair gist of the fantastic voyage that awaits the armies of the Spirit Knife: an album that finds JIRM rekindling their time-traveling communion with vintage psychedelia and Krautrock, while expanding on the sonic palette revealed by the ensemble’s past full-lengths, Elefanta and Bloom. Once again, but more powerfully than ever before, JIRM, deliver imposing passages of torrential guitars that rattle and roll, shimmy and soar with oceanic reverb and sweaty rock and roll, partnering with thrumming keys and mesmerizing Motorik drums to incite cyclical hypnosis for protracted song-suites, ever teetering between tight instrumental control and loose vibes to achieve optimal tantric tension and release through music. All this from a group founded in 2004, in the town of Eskilstuna, Sweden, before relocating to Stockhlm three years later, where and whence vocalist/guitarist Karl Apelmo, guitarist Micke Pettersson, bassist Viktor Källgren and drummer Henke Persson have since produced the aforementioned two albums and, now, the impending Spirit Knife. So remember the legends of the ancients as you file into record stores (or wherever it is people get their music in these modern, troubled and godless times) to pick up your copy of Spirit Knife — on CD, digital formats, or just maybe some crazy colored LP version that could happen down the line — and shout “Hail to the Mud People!” They knew how to rock out with their bad pre-historic selves. Recorded at Puch Studios, Stockholm, Sweden. Recorded and mixed by Viktor Källgren. Artwork and illustrations: Sebastian Thomsson. Design by Rickard Lindblom and Micke Pettersson.